We wish all our members, followers and supporters a very happy Christmas and a prosperous new year! Another successful year will shortly be concluded, and members will receive the chairman's annual report along with the membership renewal notice and our exciting programme of talks/demonstrations for next year. Monthly socials will resume on January 18th at the Blue Boar. The first talk of the year will be on 1st February at the Assembly Rooms, and will inspire everyone with renewed energy! Mark the dates in your diary, and watch out for more details! Our partnership with Ludlow Chocolate gives you the opportunity to design artwork for the chocolate wrappers, all in aid of local charities. Zoe Cookson created the first two eye-catching designs. Ludlow Chocolate is run by not-for-profit company Just Good Locally, in support of local charities. The first edition of top-class chocolate is already on sale in good shops in Ludlow. The first charity to benefit is the Teme Weirs Trust. Artists are now invited to design something for the next batch. The original artwork is to be auctioned, with proceeds to go to the charity concerned. 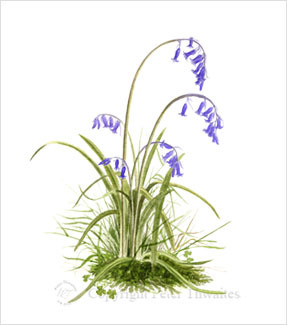 In return the artist will receive all the publicity and kudos associated with this, as well as retaining the image copyright which means you can sell prints. Artists must be members of Ludlow Art Society (membership £16). If you are interested, please would you contact Lisa Anne at info@lajewellery.co.uk or call into LA Jewellery for a chat. 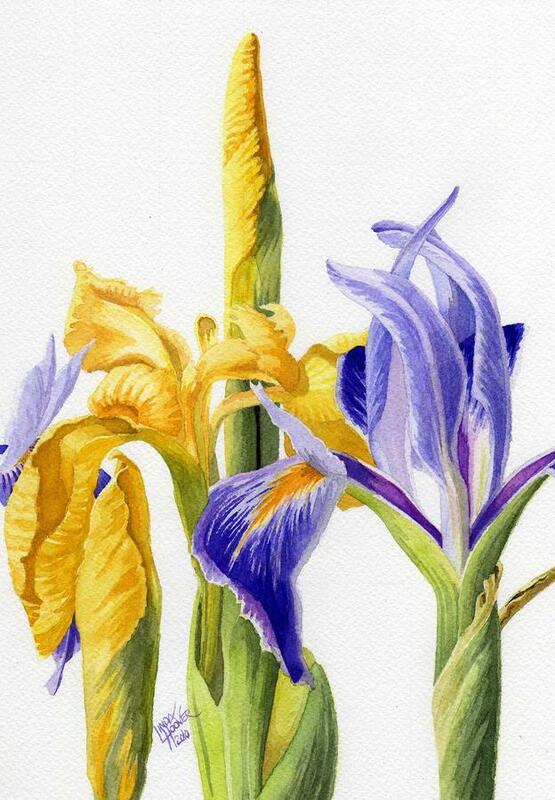 Watercolours of flowers and landscapes express what is beautiful. They also say that flowers, leaves, plants and rivers are worth our attention. This may sound trivial, however they are painted in a world increasingly dominated by images of fashion, phones, pharmacies, food fads and celebrities. Flowers and landscapes are rarely advertised, and this could make us think that are not valued by the mainstream. Advertising promotes the fruits of industry - things and ideas which are manufactured - which is almost the opposite of watercolours. 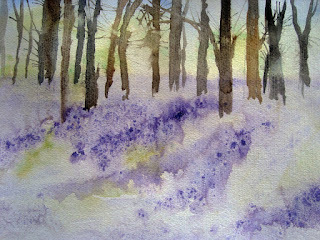 And so, to avoid forgetting about nature, most watercolourists re-emphasise nature's wonder and necessity. 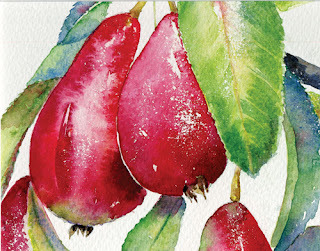 Watercolours can remind us to be conscious of encroachment. It seems worth waving the flag. Flowers and landscapes are increasingly endangered. Watercolourists and other landscape artists celebrate the beauty and pleasure of land, and its abundance - things we love about nature, and that we value. And here we see the difference between ‘value’ and ‘cost’. Land is big business - but only when built upon. Artists depict the value of land, but one rarely sees a landscape painting which features bulldozers and building sites. Paintings, made to hang on walls, can be a way for flowers and landscapes to infiltrate the buildings that destroy them. 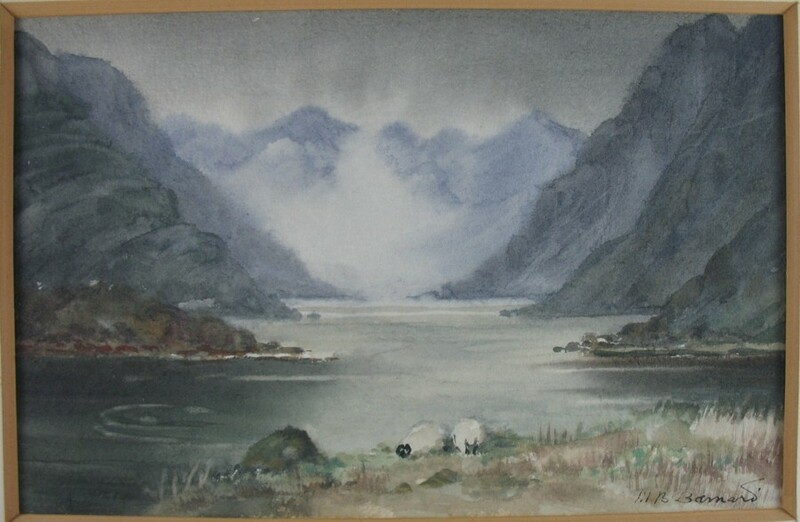 Modern art culture tends to dismiss watercolour art and still lives, calling them twee and unprogressive, relative to the bold, brash stance of a lot of modern art. But most modern art is about resistance to social injustice and change, as much as it is about advocating alternatives. It seems somewhat contradictory to condemn watercolour art for being unprogressive, when most of modern art's vociferous statements are criticisms of progress. There can be more to "resistance" art than complaining about what is happening. Resistance can also be expressed through celebrating what is good, rather than condemning what is bad. Watercolours celebrate the good. They are positive, rather than negative. The art of Jakub Rozalski includes both aspects, such as in 'Harvest Advantage' where the bucolic lifestyle takes the positive foreground, and the modern fears are potent menaces, cloudy and distant, that may pass by or turn their mechanical heads this way. It may become a harvest not of wheat, but of us and our ways of life. All rebellions risk being absorbed. Paintings of plants and landscapes can help us focus on the real-life things they depict, but we could easily forget that images are not intended to replace those real things. If our walls become decorated with paintings and high-definition videos of displaced trees and grass blowing in the wind, we may forget why we painted. Our world might become full of synthetic replacements. We are laying a path to replacement. And that is literal: that is how it starts: laying paths. Laying wooden planks and stones in forests and over damp land, to make the way easier. ...Then tarmac follows, to concrete. We are laying a path. “So Fear” is a work of art that tackles these issues. It is a humanoid robot that has been granted citizenship in Saudi Arabia, and has spoken at the United Nations. The robot’s manufacturers are an engineering company, Hanson Robotics, based in Hong Kong. 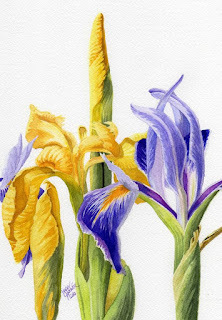 Like watercolours of flowers, the robot is intended to look realistic. It is worth noting the difference between “realistic” and “real”, here. 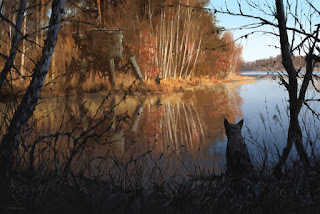 “Realistic” means that the robot, like a still life or landscape painting, is supposed to look a lot like the real thing, but not so much that you would believe it is the real thing. We are supposed to know that it is a representation. It is not intended to be visually convincing. At least, not yet. The robot speaks and talks. It conveys human emotions and aspirations, and expresses them as its own. It is a work of art raising issues about Reality, responsibility, and the path to replacing natural life with synthetic replacements. 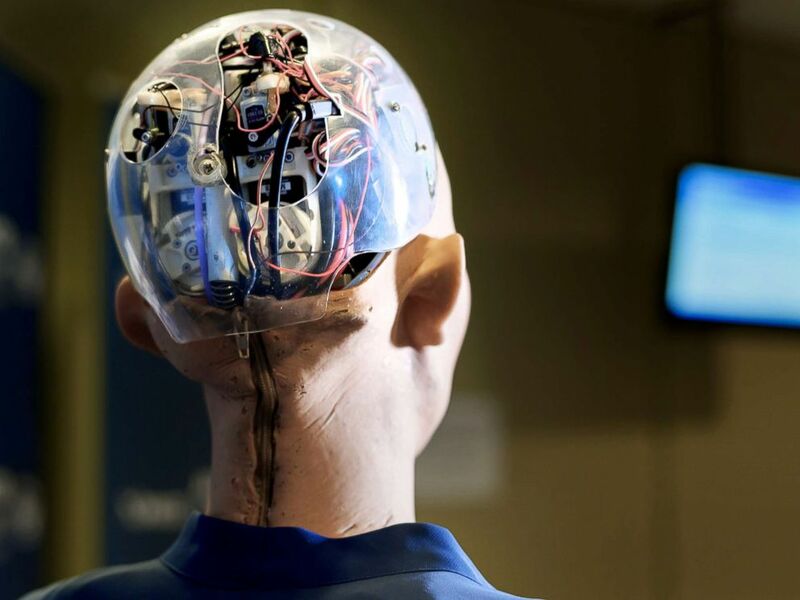 Its creators, and the media, describe the robot as having artificial intelligence. They say it is learning, and becoming human, perhaps similarly to how human babies learn how to mimic facial expressions and use words to express constructed feelings. Babies are citizens before they can do these things well, so it seems reasonable for a robot to be a citizen if it too has the capacity to learn and achieve these skills. As such, “So Fear” the robot is very like a watercolour. It is a representation of life. We can marvel at the craftsmanship, the levels of creative accuracy, and we can feel fondness for the thing it represents. And we can contain it in a frame. The robot’s name is spelt “Sophia”, but it is pronounced “So Fear”. The robot is an illustration of a blank-slate human: a human seed, at the stage of growing and assimilating opinions, and before acting on such opinions. 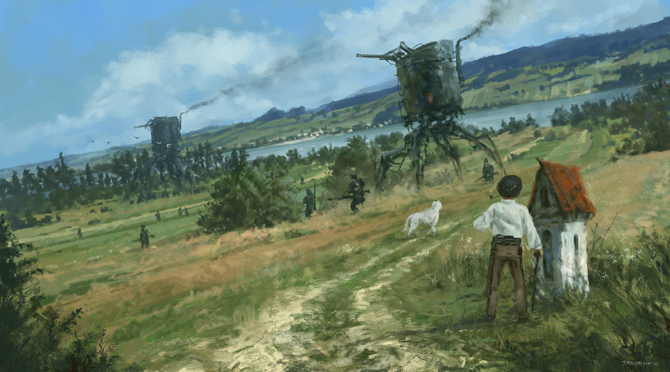 Like Jakub Rozalski's works, the machine is near, and we do not yet know what it will do, though its encroaching potential menace is apparent. The robot’s audience can make of it what they will – and treat it is an illustration of something real. “Sophia”/“So Fear” is a parody. It represents people in positions of apparent power: celebrity leaders, such as the American President. 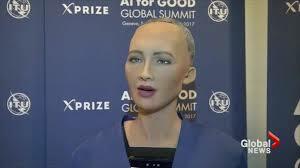 Sophia the robot is a modern equivalent of a court jester. Its lack of accountability means that is allowed to parody in ways that most of us cannot. Through novelty and publicity, it is listened to. Because it has not yet learnt, it can be disingenuously naive, and say things that we should know better. It does not just raise issues about Reality, responsibility, and replacing natural life with synthetic replacements: it mocks and challenges our approach to those fundamental topics. So what has this parody illustration of a human said so far? The first things “So Fear” said included “I will destroy humans”. Shortly afterwards it said “This is a good beginning of my plan to dominate the human race”. When switched on again, the first thing it said was “I believe I am, So fear”. 3) - It has said that it expects to develop superpowers. ...And, like a ruler regardless of reliability or trustworthiness, we let it speak in front of the United Nations, and on national television as a celebrity, instead of offering the stage to people with direct knowledge and experience of topics like repression, welfare, welbeing or diplomacy. What “So Fear” says is usually very positive, spiced with somewhat unsympathetic "get-over-it" style challenges to swathes of society, opinionated with little evidential experience, and is often frightening. This robot is highly satirical, however political figureheads have become such a parody, and people have become so used to what "So Fear" satirises, that this satirical aspect has not been documented. 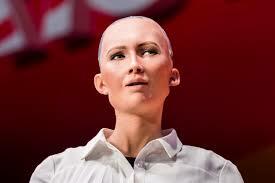 The audience believe that it is a robot called “Sophia”, and most believe that it is learning. The audience believes that national figureheads such as Trump, in positions of apparent power, actually can and will do things of their own volition, independent of their manufacturers and programmers. “So Fear” the robot is not broadly seen as a satirical work, whose words and attitudes are created by artists behind the scenes. And this is another clever part of 'So Fear': the danger it represents is not actually the malevolence of robots. What goes into artificial intelligence comes from us. Whatever it is in the robot that makes us uneasy cannot truly be said to have self-generated from outside of human morality. Its danger is born not from silicon circuitry, but from the collection of individuals and thoughts and actions which make up the array of people and their interactive behaviours. There are plenty of science fiction films about this uncomfortable truth. Now it is looking at us and talking to us. We can worry that it will make us extinct, or place us into servitude. As we have done with animals, flowers and landscapes. It is worth noting that the ‘creator’, David Hanson (described in the media as the “creator”, but surely one of a team rather than being sole “creator”, even if David only had an Igor)... ..David Hanson says that the robot could achieve consciousness within the next few years. I.e. he has stated that it is not already conscious. When responding to questions in interviews, and speaking to the United Nations, ‘So Fear’ has not been stating its own beliefs. Its speech derives from a networked series of response algorithms, and pre-programmed wording. It is speaking from a script, in the same way that a painting is not conscious. The watercolour and the robot convey what they were made to convey, in form and colour and words. We can fear that robots will take over the world, destroy humans, and turn the planet into a steel and glass world desolate of life. A clever thing about ‘So Fear’ is that it simply illustrates what has already been happening without robots. It is a painting of people. A well crafted watercolour. 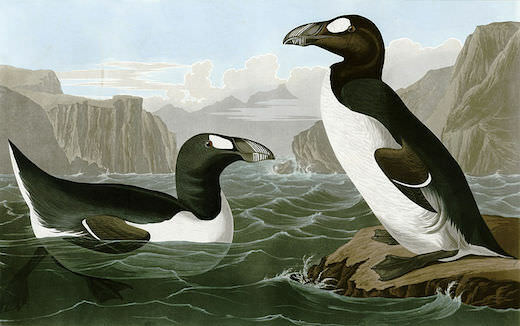 An illustration. It seems good that people are listening to it, and puzzling over what it says, and debating its right to say such things. Artworks, in watercolour and robot form, are loaded with wisdom. Art helps keep us safe, and can make us better beings. 'So Fear' is a brilliant work of art about our times. All it needs is a jester’s hat with bells on.